Skoda’s versatile SUV, the aptly named Yeti, has carried off another three top 4×4 prizes at the Total 4×4 and 4×4 awards. This rounds off a fabulous year for the Skoda Yeti, which has bagged another four awards this year alone, following on from winning the ‘Car of the Year’ at the 2010 Auto Express New Car Awards. The Yeti is steadily increasing in popularity with drivers too, with 2011 sales rising by over a third compared to 2010. Skoda was delighted to take Total 4×4 magazine’s title of the year for the second year running. Judges also honoured the Yeti’s exceptional value for money by awarding it a Special Award for Best Value. 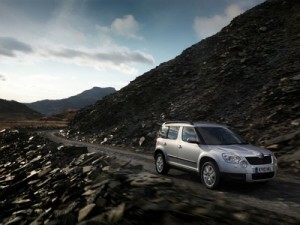 Editor Alan Kidd confesses that last year the award panel were surprised by just how good the Skoda Yeti is. This year, they couldn’t find another 4×4 able to compete with the Yeti’s combination of brilliantly conceived design, superb build and off-road capabilities. Kidd even says that, regardless of cost, there are very few off-road vehicles he’d be happier to have on his driveway. After rigorous off-road testing, 4×4 magazine selected the Skoda Yeti as their top choice in the Mid-Range Class and short listed it for their 4×4 of The Year. Again, the judges described themselves as surprised by the extent of the Yeti’s all-round strengths. Nigel Fryatt, the magazine’s editor, praised the Yeti for its impressive blend of ‘fit for purpose’ and value. He describes the Yeti as being true to the creed of the true off-roader: being able to manage in conditions that are far tougher than owners are likely to attempt. With OTR starting prices for a 4×4 Yeti starting at just £18,520 it’s not surprising that the judges from both sets of awards were so bowled over by the Yeti’s value for money. Even the super tough, top-of-the range Yeti Elegance 2.0 TDI 4×4, is available from only £24,090. If you’re interested in buying or leasing a new vehicle contact our sales team. Alternatively, visit our website where you will find new and used Skodas available for sale or on finance.